When temperatures rise in Canada, shopping season heats up. The hunt for the perfect bomber jacket and the trendiest lipstick has consumers turning to online video. And YouTube-watching fashionistas plan to spend 15% more on spring/summer fashion than general population fashionistas. Source: Google Trends data, May 2015 vs. May 2016, Canada. 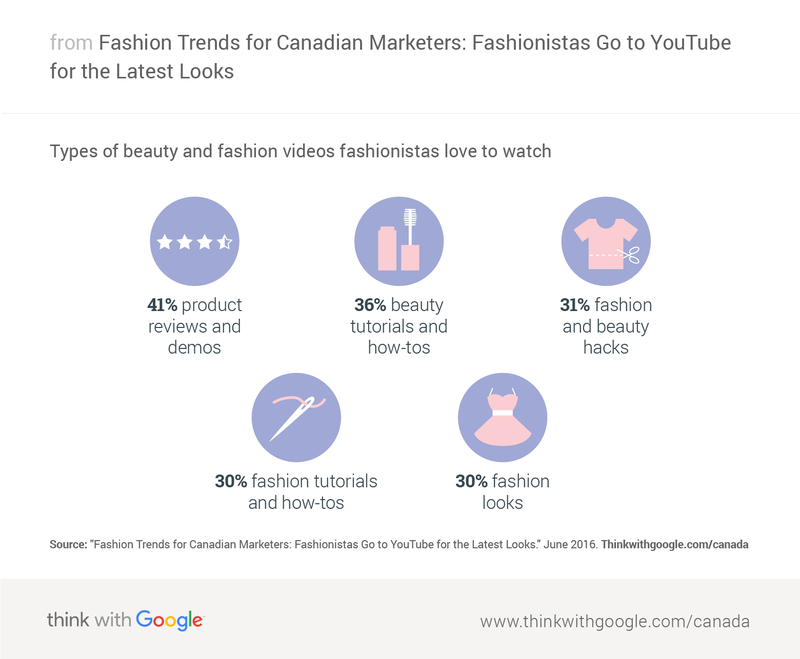 To get a deeper understanding of how shoppers engage on YouTube, we conducted research among Canadian women 18+ who are in market for spring/summer fashion and beauty purchases. Let’s call them "fashionistas." We found that seasonal changes influence 51% of fashionista YouTube watchers to consider wardrobe refreshes.2 As the weather and our wardrobes change, let’s see what this means for marketers. Source: Google/Ipsos, “Spring/Summer Fashion,” 2016, Canada, online females 18+, overall n=951. Marketer takeaways: You can reach engaged Canadian shoppers on YouTube. YouTube has diverse and passionate audiences who are more likely to engage with your ads than TV viewers. Find ways to create content relevant to what fashionistas love. Consider taking a page from a YouTube star who has a dedicated fan base and a track record of creating helpful content, like BeautyyBird’s fashion hacks video or Zoella’s product review video. 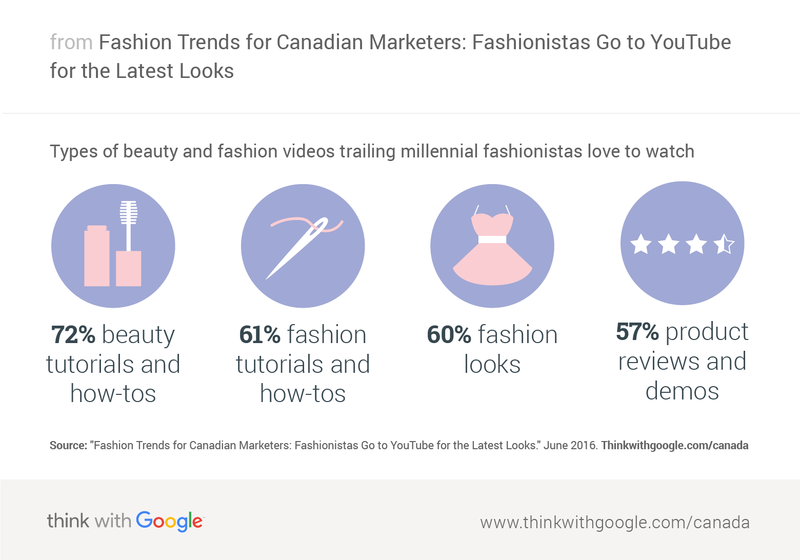 Source: Google/Ipsos, “Spring/Summer Fashion,” 2016, Canada, online females 18+, overall n=1001, YouTube users n=469, showing top two on a seven-point scale. Marketer takeaways: Get in front of YouTuber shoppers now. Seasonal changes cue shopping sprees and these YouTubers are looking for inspiration. Trailing millennials (ages 18–24) may seem like a small group now, but they can show where media consumption is headed. Let's take a look at how Canadian trailing-millennial fashionistas keep up on the latest in beauty and fashion. Source: Google/Ipsos, “Spring/Summer Fashion,” 2016, Canada, online females 18+, trailing millennials n=113. Marketer takeaways: If you want to know how your marketing strategy or media mix should evolve over the next five or ten years, understanding these trailing millennials can help pave the way forward. Trailing millennials are trendsetters, so investing in YouTube long-term can help you maximize impact and win over this (and future) emerging markets. All images created with Pantone’s colours of the year: Rose Quartz and Serenity. 1 Google Trends data, May 2015 vs. May 2016, Canada. 2 Google/Ipsos, “Spring/Summer Fashion,” 2016, Canada, online females 18+, YouTube users n=469. 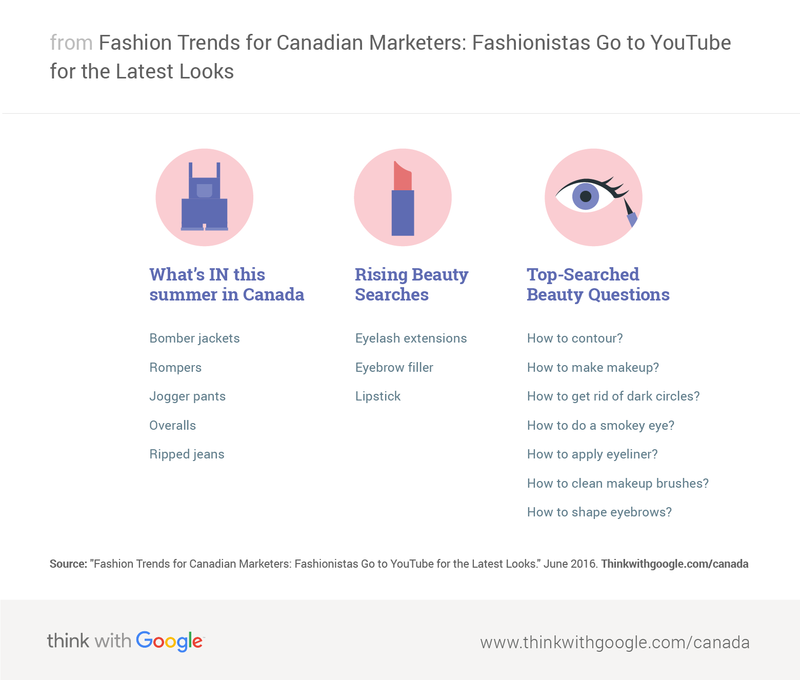 3 Google/Ipsos, “Spring/Summer Fashion,” 2016, Canada, online females 18+, overall n=951. 4 Google/Ipsos, “Spring/Summer Fashion,” 2016, Canada, online females 18+, overall n=1001, YouTube users n=469. 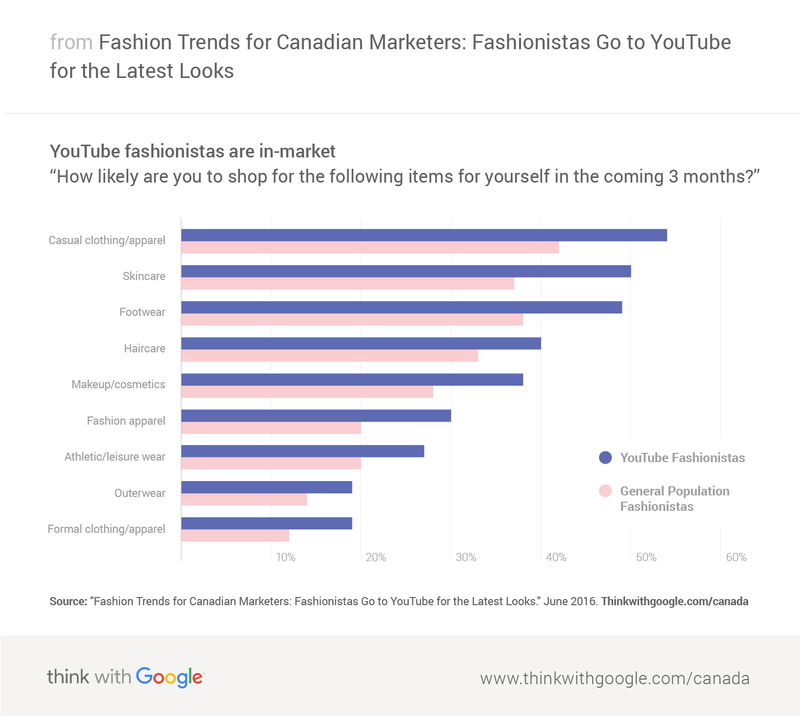 5 Google/Ipsos, “Spring/Summer Fashion,” 2016, Canada, online females 18+, overall n=1001, YouTube users n=469, showing top two on a seven-point scale. 6 comScore, “Media Metrix Multiplatform,” females, 18–24, March 2016. 7 Google/Ipsos, “Spring/Summer Fashion,” 2016, Canada, online females 18+, trailing millennials n=113.